This listing is for 6 original crochet amigurumi dinosaur patterns (Brachiosaurus, Stegosaurus, Triceratops, Amargasaurus, Kentrosaurus, Pentaceratops) from the Dinosaur range by June Gilbank. 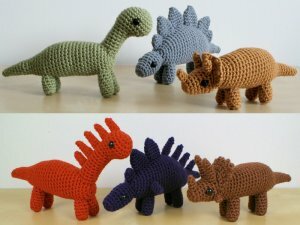 Patterns include full instructions to make your own amigurumi Brachiosaurus, Stegosaurus and Triceratops. This Dinosaurs Set 1X Expansion Pack includes includes all the modifications required to crochet and assemble Amargasaurus, Kentrosaurus and Pentaceratops dinosaurs from the Dinosaurs Set 1 patterns: Brachiosaurus, Stegosaurus and Triceratops respectively.